Certified Memorialist David Williams, of Williams Monument Company in Arvin, adds the final two major donors to the VJAMM: In loving memory of Johnny Katsui Sakioka; and: Thomas and Catherine Yoshikawa, in loving memory of Isao and Kiyako Yoshikawa. VJAMM Committee members Phyllis Hayashibara, Mae Kakehashi, Arnold Maeda, and Emily Winters secure the site while David works. Nikki Gilbert designs new 4 x 6 VJAMM post cards. VJAMM Committee has 3,000 printed by U-Printing in Santa Monica on 14 pt glossy cardstock. 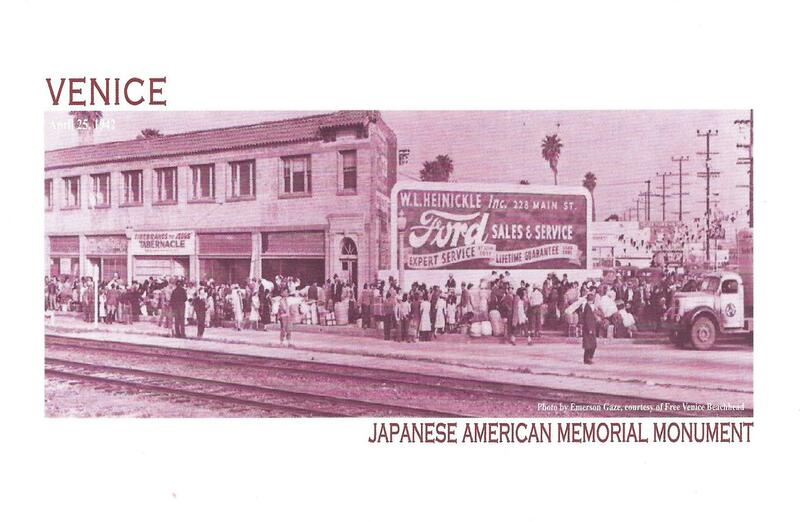 Postcard front features pink 1942 photo with railroad tracks; postcard back features updated silhouettes of the VJAMM front and back, and Thank you for supporting the Venice Japanese America Memorial Monument. Venice Community Housing YouthBuild volunteers clean the VJAMM and the surrounding sidewalk for the fourth time. They enjoy Kalua pork sliders donated by Paul Wahba of Rutt’s Café on Washington Place in West Los Angeles. 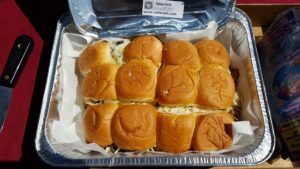 Paul Waba of Rutt’s Cafe donated a dozen Kalua Pork Sliders to the youth volunteers. 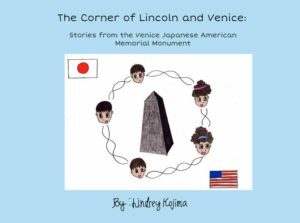 Click on the cover of The Corner of Lincoln and Venice, to read Lindsey Kojima’s book on the VJAMM. Click on INTERVIEWS to see Lindsey’s interviews with Amy Ioki, Mae Kakehashi, Arnold Maeda, Brian Maeda, June Tomita. Lindsey Kojima, of Girl Scout Troop 5325, presents VJAMM patches to Dharma School students and adult Temple members. Lindsey reads to them her book, The Corner of Lincoln and Venice. Participants complete the VJAMM questionnaire and decorate their own VJAMM model from Lindsey’s template. Special guest includes VJAMM Committee member Arnold Maeda. Dharma School students, parents, and adult Temple members participate in earning a VJAMM patch. 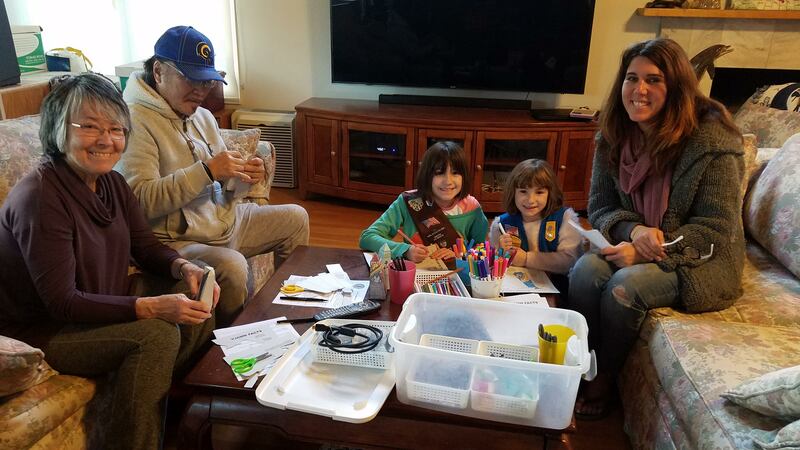 Lindsey Kojima, of Girl Scout Troop 5325, presents VJAMM patches to Nikki Gilbert, her nieces Emery and Lucy, Phyllis Hayashibara, Brian Maeda, Lucia Maeda, Alice Stek, Suzanne Thompson, and Fehmi Yildirim for completing the VJAMM questionnaire and for decorating and putting together a paper VJAMM model from her template. Lindsey sent VJAMM patches to Arnold Maeda and Emily Winters for completing the questionnaire, though they could not come that afternoon. Lindsey previews her book, The Corner of Lincoln and Venice, and incorporates suggestions made by VJAMM Committee members. VJAMM Committee members Phyllis Hayashibara, Alice Stek, Suzanne Thompson, and Fehmi Yildirim attend the Manzanar Committee-sponsored book signing by Dr. Arthur Hansen at the Gardena Valley Japanese Cultural Institute. Dr. Hansen autographed copies of his newest book, Barbed Voices: Oral History, Resistance, and the World War II Japanese American Social Disaster, with a foreward by Dr. Lane Ryo Hirabayashi. Venice Community Housing YouthBuild volunteers receive training from VCH’s Clarence Dorsey on the gas-powered pressure washer to clean the sidewalk, but the dried gum residue proves to be resistant. Must bring putty scrapers to start scraping the gum residue starting in January 2019. Thank you to Lucia and Brian Maeda for bringing donuts for the early morning clean up. Thank you to Gustavo of Beach Cities Carwash for providing hoses and water, and thank you to Carwash operator Steve Spunt for sharing the water. Betsy Goldman of ReMax Estate Properties donates to the VJAMM Committee 100 copies of the 2019 Venice Community Calendar, which features the Japanese American community in Venice, the Venice Japanese American Memorial Monument, and the VJAMM Committee. The VJAMM Committee distributed all 100 copies of the calendar to VJAMM supporters. Venice Community Housing YouthBuild volunteers clean the VJAMM and the surrounding sidewalk for the third time. They enjoy sesame chicken wings and chicken salad from Marcus Toji and Jared Nishikawa of Feast from the East on Westwood Boulevard. Marcus Toji and Jared Nishikawa of Feast from the East donated sesame chicken and salad lunches. John Mooney and Zed Aquarian help VJAMM Committee members Phyllis Hayashibara, Alice Stek, Emily Winters set up the VAC/VJAMM booth #576. Informational VJAMM postcards and past Argonauts, Free Venice Beachheads, and Venice High School Oarsmen available for the taking. VJAMM opportunity drawing for one of three sets of five bowls won by Fehmi Yildirim, Remington Hoffman, and Jose Mercado. Venice Community Housing YouthBuild volunteers return for the second time to clean the VJAMM and sweep the sidewalk and curbs as part of their monthly community service. Nine youth and two YouthBuild staff participate, and share teriyaki chicken lunches donated by Janis Toya of Sakura Japanese Restaurant on Centinela. YouthBuild volunteers jump for joy after polishing the VJAMM and sweeping up the debris. 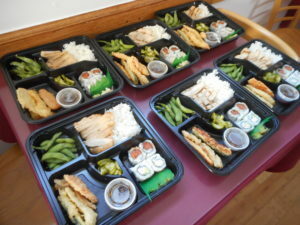 Janis Toya of Sakura Japanese Restaurant donated chicken terikayki lunches. Brian Maeda screens his preview of “We Said No NO” at the Terasaki Nibei Foundation on Olympic Boulevard for about 50 participants. Phyllis opens the program with a slide presentation on the Venice Japanese American Memorial Monument, and introduces Brian as a VJAMM Committee member. VJAMM Committee members Kay Brown, Mae Kakehashi, Arnold Maeda, Emily Winters, and Alice Stek with Fehmi Yildirim also attend in support of Brian and his film. Nancy Oda, daughter of judo sensei Tatsuo Ryusei Inouye, unjustly imprisoned in the military stockade at Tule Lake Segregation Center; with filmmaker and VJAMM Committee member Brian Maeda. Venice Community Housing YouthBuild volunteers clean the VJAMM and sweep the sidewalk and curbs as part of their monthly community service. Nine youth and two YouthBuild Directors participate, and share grilled veggie sandwiches and tuna salad sandwiches donated by James’ Beach in Venice with a couple of passers-by, too. James Evans of James’ Beach donated grilled veggie sandwiches and tuna salad sandwiches. Girl Scout Lindsey Kojima of Troop 5325, with approval for her Gold Award project on the VJAMM, interviews VJAMM Committee members and former Manzanar internees Mae Kakehashi, Brian Maeda, Arnold Maeda, June Tomita (widow of Yosh Tomita), and Amy Ioki for her planned book and video on the VJAMM. Lindsey has already introduced to about fifty children at Kizuna summer youth camp her VJAMM slide presentation and making a paper model of the VJAMM which the children decorate. Lindsey Kojima interviews Mae Kakehashi on Monday, July 23, 2018. Lindsey interviews Brian Maeda on Tuesday, July 24, 2018. Lindsey interviews Arnold Maeda on Friday morning, July 27, 2018. Lindsey interviews June Tomita, Yosh Tomita’s widow, on Friday afternoon, July 27, 2018. Lindsey interviews Amy Ioki on Thursday, August 16, 2018. Alice Stek notifies the VJAMM Committee that the ad wall behind VJAMM has been removed! Phyllis Hayashibara writes a VJAMM letter of appreciation to Los Angeles City Councilmember Mike Bonin, District 11, with copies to Land Use and Planning Director Krista Kline and Land Use and Planning Deputy Len Nguyen. Phyllis Hayashibara, Arnold Maeda, and Emily Winters present a brief slide show at the all- staff meeting at Venice Community Housing, to explain the VJAMM, and thank Venice Community Housing for its fiscal sponsorship of the VJAMM Committee. 718 – 720 Rose Avenue, affordable housing project with 34 units and VCH offices on Rose at Lincoln. Reese-Davidson, affordable housing project with 140 units, at Pacific and Dell at Venice. Beyond Baroque hosts a VJAMM educational outreach program from 2 pm to 4 pm, featuring “Behind Barbed Wire,” Deon Price’s composition for piano (Mary Au) and saxophone (Chika Inoue) with haiku written by camp internees; “And Then They Came for Us,” 2017 documentary film by Abby Ginzberg and Ken Schneider; with Q&A and discussion moderated by Brian Maeda. Attorneys for Atlantic Microscope, new owners of the 1413 Michigan Avenue property, send a letter and their Historic Resource Assessment (https://www.smgov.net/departments/pcd/agendas/Landmarks-Commission/2018/20180514/20180514%209_B%20Attachment%20C%20McGee%20Historic%20Resource%20Assessment%20FINAL%2004.23.18.pdf) to the Santa Monica Landmarks Commission. They support the designation of the former Japanese American social hall as a cultural resource. VJAMM Committee members Mae Kakehashi, Alice Stek with friend Fehmi Yildirim, Emily Winters, and Phyllis Hayashibara attend the 49th annual Manzanar Pilgrimage, and set up a VJAMM table to distribute NPS JACS 2017 Year in Review (VJAMM on page 46), VJAMM Dedication Programs of April 27, 2017, VJAMM postcards, May 26 Beyond Baroque postcards (Behind Barbed Wire, And Then They Came for Us, Panel), VJAMM Commemoration and Fundraiser flyers from April 19, 2018, and the Argonaut of April 28, 2018 featuring Mae Kakehashi’s interview and photographs (page 10 and 11). LA DWP sends out a night rider to check on installation of directional illumination on VJAMM, and reports that the night light works well. Thank you, LA DWP! VJAMM will pay VCH the $10.50/month billed at their 200 Lincoln property. LA DWP nightlight illuminates the VJAMM for safety and security. VJAMM 7th annual fundraiser at Hama Sushi sells out 264 bento orders at lunch! Esther Chaing donates 100% of the bento profits and 10% of all dinner sales to VJAMM, for a total donation of $3,916.00 Over seven years, Esther has donated to the VJAMM $22,478.53. Thank you to Esther and Jung Chaing, Tony Kim, Naoko Matsumura, and Kenny Moon at Hama Sushi. Thank you to Pauline Hayashibara, and the Fujinkai ladies of Venice Hongwanji Buddhist Temple for helping to assemble, pack, and distribute bento: Joyce Enomoto, June Fujioka, Shinobu Koda, Aya Masada, Judy Nawa, Alice Ogawa, Sandy Saeki, Karen Tokuda. VJAMM Commemoration at the VJAMM Site: first anniversary after the VJAMM Dedication on April 27, 2017; thirty years after the passage of the Civil Liberties Act of 1988; seventy-six years after the signing of Executive Order 9066 on February 19, 1942. Morning rains may have kept away a larger audience. Guest speakers include: Emily Winters, Alice Stek, Becky Dennison for Venice Community Housing, Len Nguyen for Los Angeles City Councilmember Mike Bonin, District 11; Stephanie Cohen for Los Angeles County Supervisor Sheila Kuehl, District 3; Daisy Paniagua-Uribe for U.S. Representative Ted Lieu, CA 33; Dave Iwataki on his “J-town/Bronzeville Suite”; Dr. Curtiss Takada Rooks of Loyola Marymount University on “Shared Peoplehood”; Nikki Gilbert, Brian Maeda, Bruce Embrey of the Manzanar Committee on the Civil Liberties Act of 1988 and the 49th annual Manzanar Pilgrimage, and Suzanne Thompson. Venice Dolphins basketball team, many of whom also belong to Girl Scout Troop 5325 which meets at the Venice Hongwanji Buddhist Temple, sweep up the sidewalk debris from the bus stop stations on Venice and Lincoln to the VJAMM, and wipe down with Windex the VJAMM itself. No discernible damage to the VJAMM or foundation after the 5.3 earthquake on Thursday, April 5, 2018 at 12:30 pm off the Ventura coast, by the Channel Islands. Girls enjoy Jersey Mike’s sub sandwiches for lunch. Beyond Baroque reprises 2010 haiku reading from May Sky, There is Always Tomorrow, An Anthology of Japanese American Concentration Camp Kaiko Haiku, compiled, translated, and prefaced by Violet Kazue de Cristoforo, 1997, by Sun and Moon Press. 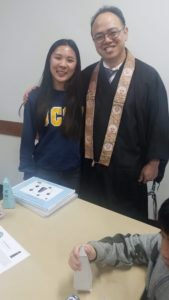 Haiku readers in Japanese: Reverend John Iwohara of Gardena Buddhist Church; Emily Kariya, teacher at Santa Monica High School. 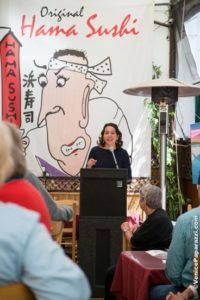 Haiku readers in English translation: Richard Modiano, Executive Director of Beyond Baroque; Amy Uyematsu, Sansei poet; Laurel Ann Bogen, Venice poet. Prose readers from the VJAMM Committee: Phyllis Hayashibara, Alice Stek, Emily Winters. Intro to Violet’s biography by VJAMM Committee member Brian Maeda. VJAMM Committee members and former MAnzanar internees Arnold Maeda and Mae Kakehashi join fellow former Manzanar internees Susumu Ioki and Mary Nomura, the Songbird of Manzanar, on a panel presentation before 150 juniors in the World Languages Global Studies Venice High School Magnet. Teachers Cristobal Vicente-Aguilar, Jennifer Barnhill, and Trasey Nomachi invite Phyllis Hayashibara to give a presentation on the VJAMM and to organize the panel of speakers. The building was again pulled from the list at their December 11, 2017 meeting, and considered for Designation of a Structure as a City Landmark or Structure of Merit. The Executive Summary of January 30, 2018 found that the Building is eligible for listing as a City of Santa Monica Landmark. (https://www.smgov.net/departments/pcd/agendas/Landmarks-Commission/2018/20180212/20180212%209_A%201%201413%20Michigan%20Ave%20Staff%20Report.pdf). Venice Arts of 13445 Beach Avenue in Venice, invites Phyllis and Arnold to join their 25th anniversary exhibition/celebration from 5 pm to 8 pm. Students had interviewed Arnold Maeda and Phyllis Hayashibara way back on July 25, 2016 at Venice Arts on 1702 Lincoln Boulevard in Venice. Phyllis requests a copy of the filmed interview for VJAMM. Available on line at https://www.youtube.com/watch?v=_q1SftJ7GlY&feature=youtu.be, titled, “Venice Arts presents Venice Streets”. Fehmi Yildirim of Turkey, and friend of VJAMM Committee member Alice Stek, volunteers to help Phyllis Hayashibara Windex the VJAMM and sweep up the sidewalk debris, 3:30 to 4:00 pm. Michael Craig of LA DWP meets with Phyllis to complete Exhibit 1, to order a light sensitive 85 DL (Light Emitting Diode, Directional Fixture) at 2305 Lincoln Boulevard on an existing pole to illuminate the VJAMM. Becky Dennison and Priscilla Smith of Venice Community Housing agree to allow the LA DWP bill the VCH property at 200 Lincoln the $10.50 per month cost. VJAMM agrees to reimburse VCH on a monthly basis. Passerby Michael Christian of Paris, France gets off the bus and offers to help Phyllis clean off the VJAMM obelisk. He sees that she cannot easily reach the top with her long handled sweeper. VJAMM Committee members Phyllis Hayashibara and Emily Winters attend the Los Angeles premiere of documentary filmmakers Abby Ginzberg’s and Ken Schneider’s “And Then They Came For Us” at the Downtown Independent, 251 South Main Street, Los Angeles, CA 90012. After the 40-minute film, panelists include filmmakers Ginzberg (abbyginzburg@gmail.com) and Schneider, Marya Bangee of SILA (marya.bangee@gmail.com), Ahilan Arulanantham of the Southern California ACLU, and Ivan Ceja of Undocumedia (DACA) (ivan@undocumedia.org, www.undocumedia.org). VJAMM Committee members Arnold Maeda, Brian Maeda, Phyllis Hayashibara, and Alice Stek attend the Mu Phi Epsilon Los Angeles Alumni Chapter Founders Day Celebration Concert at Mt. Olive Lutheran Church, 1343 Ocean Park Boulevard, Santa Monica, CA 90405. Saxophonist Chika Inouye (chika@chikainoue.com, www.chikainoue.com) and pianist Mary Au (auhaus@gmail.com, www.aumary.com) perform composer Deon Price’s “Behind Barbed Wire,” 2016, with spoken haiku by camp internees and with video of WWII scenes of Pearl Harbor, the War Relocation Authority camps, and Hiroshima and Nagasaki. George and Stephanie Sakioka make a major donation to the VJAMM with additional funds to cover continued maintenance. They request that their donation not include the dollar amount. They request this inscription on the VJAMM: IN LOVING MEMORY OF JOHNNY KATSUI SAKIOKA. VJAMM Committee member Phyllis Hayashibara attends Dave Iwataki’s “J-Town/Bronzeville Suite” at the Gardena Valley Japanese Cultural Institute, 1964 West 162nd Street, Gardena, CA 90247. J-Town Ensemble: Shigin by Patrick Seki, Shakuhachi by Greg Matsuura, Flute by Rumi Patterson, Taiko by Shiwei Wu, Koto by Yuki Yasuda. Bronzeville Quarter: Piano by Theo Saunders, Bass by Henry Franklin, Drums by Don Littleton, Sax by Louis Van Taylor. Panelists: Bronzevile scholar Dr. Hillary Jenks (hjjenks@yahoo.com), visual artist Kathy Foley-Meyer (Kathie@kf-m.com, kathielyn@me.com), jazz historian Kirk Silsbee, composer David Iwataki. King Fahad Mosque members Mohammed Abdul Aleem and his wife, Maleeha, present the 1,000 cranes to the King Fahad Mosque after 1:00 pm prayers. Phyllis Hayashibara thanks the Mosque for their early support of the VJAMM in 2011, and Dr. Jimmy Hara shares the story of Sadako and the 1,000 cranes. Suzanne Thompson and Fehmi Yidirimi take photos and post them on the VJAMM Facebook page. Venice-West LA JACL organizers Amy Watanabe and Annia Yoshizumi come with supporters Rie Watanabe and Joanne Tsuichika. VJAMM Committee members Phyllis Hayashibara, Mae Kakehashi, Arnold Maeda, Alice Stek, Suzanne Thompson, and Emily Winters staff Booth #578 at Milwood on the west side of Abbot Kinney Boulevard for the Abbot Kinney Festival. Display includes photos of installed VJAMM at northwest corner of Venice and Lincoln, VJAMM postcards, VJAMM Dedication programs. VJAMM collects $44 in donations and opportunity drawing tickets. VJAMM awards three sets of donated five sake cups (sumo, flowers, or Japan designs) with two sake bottles (2) or one sake bottle and four chopstick rests (1) to winning ticket holders. AKF Community Grant report and VJAMM Curriculum now overdue, which Phyllis will complete. VJAMM thanks Venice Arts Council’s John Mooney, Zed Aquarian, and Regina Barton for helping set up, staff, and break down shared booth. VJAMM Committee members Kay Brown, Phyllis Hayashibara, and Emily Winters thank the Malibu City Council for their support and distribute copies of the VJAMM Dedication program to Mayor Skylar Peak, Mayor Pro Tem Rick Mullen, and Councilmembers Lou La Monte, Laura Rosenthal, and Jefferson Wagner. Mayor Skylar Peak, Mayor Pro Tem Rick Mullen, Councilmember Laura Rosenthal, Councilmember Lou La Monte, Councilmember Jefferson “Zuma Jay” Wagner. Venice-West Los Angeles JACL holds “1000 Cranes: Solidarity, Vigilance, and Peace” event at VJAMM site, 1:30 pm to 3:00 pm. Speakers include keynoters Warren Furutani and Tanzila “Taz” Ahmed, and Phyllis Hayashibara, who thanked the Venice-WLA JACL for holding its event at the VJAMM site. Program features taiko performance by Nakama Daiko and special presentation of 1,000 cranes to Mohammed Abdul Ahmed of the King Fahad Mosque of Culver City. Coordinator: Amy Watanabe, amywata@gmail.com. Event made possible by partners: Camp Musubi, Venice Japanese American Memorial Monument Committee, Los Angeles City Councilmember Mike Bonin. VJAMM Major Donor Appreciation Reception at Suzie Tomiko Yamato’s home, 2229 Prospect Avenue, Venice, CA 90291, from 2 pm to 5 pm draws a total of forty-two attendees. Alice serves as emcee for the program. Performances include music by the Shoo Flies, Emily Wong on koto, poet Amy Uyematsu, and the Songbird of Manzanar, Mary Nomura, on vocals. Refreshments include donations from Sushi Girl, Feast from the East, Angel Maid, and Rutt’s Inn. Thank you to Eugene and Phyllis Hayashibara for donations of wine and sake, and cookies. Thank you to Los Angeles City Councilmember Mike Bonin’s office for the 50 padded chairs, 9 tables, and 9 tablecloths, delivered and picked up by AAA Rentals. Los Angeles City Councilmember Mike Bonin, 11th District, presents a framed Certification of Appreciation to the VJAMM Committee, which the Committee presents to Jennie Tomita in honor of Yosh Tomita. VJAMM Committee members Kay Brown, Phyllis Hayashibara, Suzanne Thompson, Jennifer Tomita, and Emily Winters thank the Los Angeles City Council for their support and distribute copies of the VJAMM Dedication program to the fifteen Councilmembers: 1.Gilbert Cedillo, 2. Paul Krekorian, 3.Bob Blumenfield, 4.David Ryu, 5.Paul Koretz, 6.Nury Martinez, 7.Monica Rodriguez, 8.Marqueece Harris-Dawson, 9.Curren Price, Jr., 10.Herb Wesson, Jr., 11.Mike Bonin, 12.Mitchell Englander, 13.Mitch O’Farrell, 14.Jose Huizar, 15.Joe Buscaino. Mayor Eric Garcetti was USPS mailed a copy of the program in appreciation for his signed Los Angeles City Certificate of Recognition, presented to the VJAMM Committee at the VJAMM Dedication on April 27, 2017. Senior Field Deputy Len Nguyen, who drafted the text of the Certificate of Appreciation, joins the VJAMM Committee for the commemorative photo. Senior Field Deputy Len Nguyen, Emily Winters, Phyllis Hayashibara with Manzanar baseball presented by Mike Bonin, 11th District City Councilmember Mike Bonin, Suzanne Thompson, Jennifer Tomita with framed Certificate of Appreciation from Mike Bonin to the VJAMM Committee, and Kay Brown. VJAMM Committee members Phyllis Hayashibara, Alice Stek, Emily Winters, and Suzanne Thompson visit the Santa Monica City Council to thank them for their support and to distribute copies of the VJAMM Dedication program to Mayor Ted Winterer, Mayor Pro Tem Gleam Davis, and Councilmembers Tony Vazquez, Kevin McKeown, Sue Himmelrich, Pam O’Connor, and Terry O’Day. Council was in closed session. Emily Winters, Suzanne Thompson, Alice Stek, Phyllis Hayashibara, and Fehmi Yildirim in Santa Monica City Council chambers. 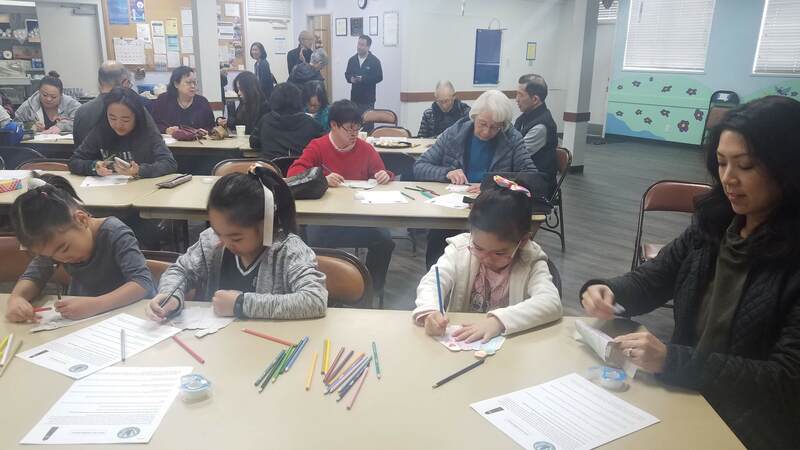 Junior Young Buddhist Association members from the Venice Hongwanji Buddhist Temple participate in the maintenance of the VJAMM at 11:30 am under the supervision of sponsor Vickie Tokirio. VJAMM provided the cleaning supplies and tools, bottled water, fruit snacks, and trail mix for Jr YBA members Lindley Kojima, Matthew Kojima, Amanda Matsubara, Jared Matsubayashi, Toni Tokirio, Alyssa Uyeda, and Chrissy Wakasa. VJAMM Committee member Arnold Maeda participates in a panel discussion on Japanese American life before, during, and after WWII with Dr. Thomas Yoshikawa and Dr. Jimmy Hara. Jill Prestup, President of the Venice Historical Society, organized the Quarterly Lecture Series at the Oakwood Recreation Center, California and 7th Avenues, from 6:30 pm. Over 70 people attended, and Venice Historical Society signed up 5 new members, a rousing success. Arnold Maeda, Dr. Thomas Yoshikawa, Dr. Jimmy Hara at the Oakw0od Recreation Center for the Venice Historical Society panel. Venice Historical Society counted 70 participants and 5 new members. VJAMM Committee members Phyllis Hayashibara, Alice Stek, Suzanne Thompson, and Emily Winters thank the Venice Neighborhood Council at its meeting at Westminster School, for VNC’s unanimous support for the VJAMM on June 15, 2010, and for Ira Koslow’s motion for increasing funding for VJAMM’s Community Improvement Project to $1,300.00 on May 24, 2011. VJAMM distributed copies of the VJAMM Dedication Program, April 27, 2017, for President Ira Koslow, VP George Francisco, Secretary Melissa Diner, Treasurer Hugh Harrison, Land Use and Planning Chair Matthew Royce, Outreach Officer Matt Kline, Communitcations Officer Evan White, Community Officers Brad Adams, Cayley Lambur, Colleen Saro, Dax Kimbrough, Hollie Stenson, Ilana Marosi, Jim Murez, John Reed, Matt Shaw, Michelle Meepos, Robert Thibodeau, Steve Livigni, Sunny Bak, and Will Hawkins. Senior Girl Scout Troop 5325, which meets at the Venice Hongwanji Buddhist Temple under the leadership of Victoria Yamashita (accompanied by Mom Lisa Yumori), meets at 11:30 am to Windex the VJAMM and sweep up the sidewalk debris between the two bus stop shelters. Suzanne arranges for Esther Chaing’s donation of 100 pieces of sushi for lunch. Thank you to Esther and the Senior Girl Scouts: Leila Fernandez, Amanda Matsubara, Jacklyn Oldoerp, Inori Kawguchiya, Lindsey Kojima, Chrissy Wakasa, Ally Yamashita, and Junior Jennifer Yamashita. NPS JACS approves final VJAMM Reibursement Request #5 in the amount $12,305.49. CalTrans Inspector Tuan Hua (work 213-897-0352, mobile 661-305-1125) calls Phyllis back to say that he would inspect the VJAMM and let us know if he has any questions. Brian Maeda, at the invitation of Cal State University Los Angeles professor of Political Science Donna Schuele, attends performance of Jeanne Sakata’s one-man play about Gordon Hirabayashi, “Hold These Truths,” at the Pasadena Playhouse, 39 S. EL Molino Avenue in Pasadena, and participates in the after-play panel discussion on the JA internment and the recent VJAMM dedication. NPS JACS Final Report FAXED and FEDEXed to Kara Miyagishima with final Reimbursement Request #5 in the amount of $$12,305.49. Los Angeles City Board of Public Works invites the VJAMM Committee to their 10:00 am meeting to present the Certificate of Recognition signed by all five Commissioners: President Kevin James, Vice President Heather Repenning, President Pro Tempore Michael Davis, Commissioner Joel Jacinto, and Commissioner Luz Rivas, as part of the celebration of May as Asian and Pacific Island Heritage Month. Kay Brown, Phyllis Hayashibara, Mae Kakehashi, Colleen Hoff (Mae’s daughter), Arnold Maeda, Brian Maeda, Suzanne Thompson, Jennifer Tomita (Yosh’s daughter), Emily Winters, Senior Field Deputy Len Nguyen of Mike Bonin’s office, Gerry Valido and Paul Racs, Director of the Office of Community Beautification, attend. 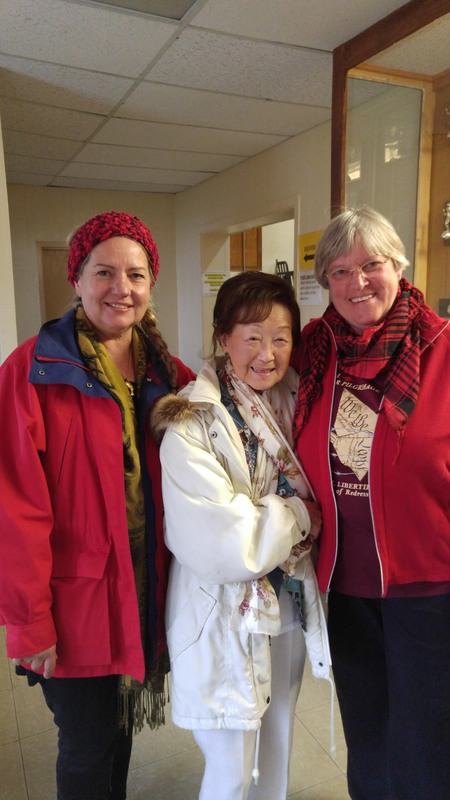 VJAMM Committee members Phyllis Hayashibara, Mae Kakehashi Alice Stek, Jim Smith, Suzanne Thompson, and Emily Winters join the 2,000 participants at the 48th annual Manzanar Pilgrimage. Keynote speaker Warren Furutani mentions the Venice Japanese American Memorial Monument in his remarks. VJAMM set up an information table draped with the VJAMM banner and distributed VJAMM postcards and VJAMM Dedication programs to Manzanar Committee members and former internees of Manzanar. VJAMM Dedication on the northwest Corner of Venice and Lincoln from 10 am – 11:30 am draws 200 participants. Jim Smith (Free Venice Beachhead), Ruth Galanter (former LA City Councilmember, District 6), Joel Jacinto (Board of Public Works Commissioner), Zev Yaroslavsky (former Los Angeles County Supervisor, District 3), Rachel Zaiden (Senior Field Deputy for LA County Supervisor Sheila Kuehl, District 3), Len Nguyen (Senior Field Deputy for LA City Councilmember Mike Bonin, District 11), Kevin McKeown (former Santa Monica City Mayor and current Councilmember), Jeff Burton (Manzanar National Historic Site), Dr. Jimmy Hara (born in Gila River, Arizona), and Dr. Thomas Yoshikawa (former Manzanar internee) precede keynote speaker Warren Furutani, community activist and Manzanar Pilgrimage pioneer. Some 200 supporters attend the VJAMM Dedication on Thursday, April 27, 2017. 6th annual VJAMM Fundraiser at Hama Sushi sees record 301 bento sold! Esther Chaing donates to the VJAMM 100% of bento profits and 10% of dinner sales, a generous $4,009.10. Over six years, Esther’s donations to the VJAMM total $18,562.53! Thank you to many members of the Venice Hongwanji Buddhist Temple Buddhist Women’s Association, the Fujinkai, for assembling and distributing the bento at Hama Sushi: Joyce Enomoto, June Fujioka, Shinobu Koda, Aya Masada, Irene Matsumura, Judy Nawa, Alice Ogawa, Karen Tokubo, Cyndy Uehara, Lauren Wolpert, and Sharyn Yoshimi. Hama Sushi could not have done it without their invaluable help. Naoko Matsumura, Esther Chaing, and Tony Kim of Hama Sushi Restaurant in Venice, California. 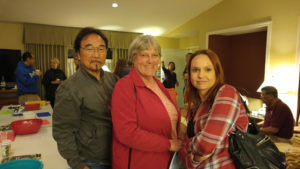 Jack Fujimoto invites Arnold Maeda to moderate and Phyllis Hayashibara to speak at Sawtelle Stories Forum 14, at the New Center for Psychoanalysis, 2014 Sawtelle Boulevard, Los Angeles, CA 90025. Phyllis narrates a Power Point presentation of slides detailing the 16-year journey from the concept of the Venice Japanese American Memorial Monument through its dedication on April 27, 2017, focusing on the initial gathering of community and political support, fundraising, engineering studies required, evolution of the VJAMM design, and the approvals and permit required by the California State Department of Transportation, and by the Los Angeles City Council, Cultural Affairs Commission, Office of Community Beautification, and the Board of Public Works. Tony, John, and Ruben of United Riggers and Erectors, Inc. install VJAMM at 8 am on the northwest corner of Venice and Lincoln, with crane operated by Hal of Anglemyer Crane, and traffic mitigated by Eric and Todd of The Permit Company. David Perka of Los Angeles City GSD Construction Forces Division, and David and Emily Williams of Williams Monument Company in Arvin supervise, while VJAMM Committee members Phyllis Hayashibara, Arnold Maeda, Alice Stek, and Emily Winters bear witness and take lots of photos. 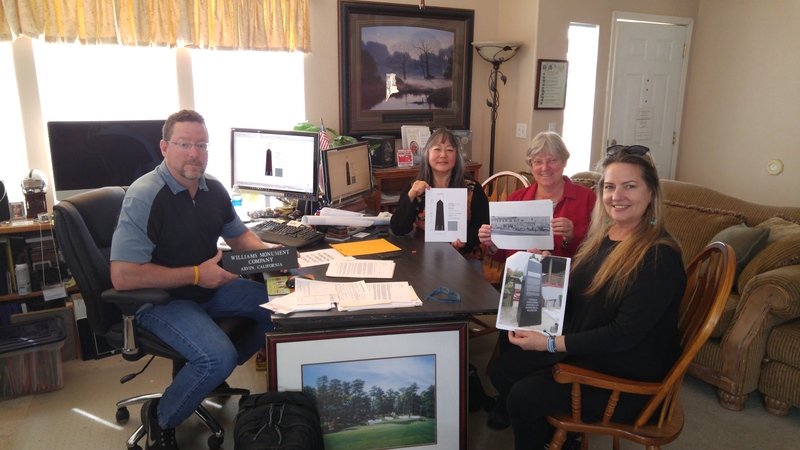 David Williams of Williams Monument Company in Arvin receives final payment for VJAMM obelisk and contract addendum from Emily and Phyllis of the VJAMM Committee. Tony of United Riggers and Erectors, Inc. supervises lifting of 12,500 pound VJAMM obelisk onto Ruben’s flatbed truck, with crane operator Travis and on-the-ground wrapper Tucker of Turner Translift, Inc (510 East Norris Road, Bakersfield, CA 93308, 661-399-9377) doing the heavy lifting. VJAMM will rest in a secure location until installation. VJAMM Committee agrees on VJAMM Dedication souvenir program cover design and page layout. Designer Nikki Gilbert submits U-Printing invoice of $3,175.77 for 1,000 programs, full color, 36 pages and her own invoice for $800.00. 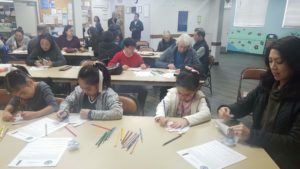 Distribution of 1,000 programs: 200 at April 27 Dedication, 200 at April 27 Hama Sushi Bento fundraiser, 100 at April 27 Hama Sushi Dinner fundraiser, 100 at April 29 Manzanar Pilgrimage, 400 for funders, supporters, community centers, religious and cultural institutions. 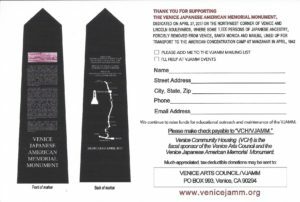 Suzanne Thompson reports that the Arts Activation Fund has granted the Venice Arts Council $2,996.00 for the costs of designing and printing 1,000 copies of the VJAMM Dedication Souvenir Program. 75% ($2,247) will be paid to the VAC once the contract has been signed, and 25% ($749) will be paid to the VAC after all receipts are paid. Includes $800 for Nikki Gilbert, Program Designer. LA City pours concrete into the excavation over the rebar. Twenty-eight days to set. LA City installs Rebar over the slurry to anchor the VJAMM obelisk. Four rebar posts to anchor VJAMM from below. Structural Engineer Mike Sullaway signs off on 12 inches of slurry (gravel and sand) beneath concrete footing, as requested by David Perka after the GEO tech report. This conduit was not detected by Digalert! Malibu City Council grants $5,000 to the VJAMM, with Mayor Pro Tem Skylar Peak, Councilmember Rick Mullen, Councilmember Laura Rosenthal, Mayor Lou La Monte, Councilmember Jefferson “Zuma Jay” Wagner, unanimously voting in favor. On February 13, Arnold Maeda and Phyllis Hayashibara spoke to the Malibu City Council in favor of putting this request on the agenda, which was scheduled. On February 27, Arnold Maeda, Brian Maeda, Suzanne Thompson, and Emily Winters spoke in favor of this request. Brian Maeda, Suzanne Thompson, Arnold Maeda, Emily Winters at the February 27, 2017 Malibu City Council meeting. VJAMM Committee members Phyllis Hayashibara and Emily Winters meet with David Williams to approve the stencils for the VJAMM before David begins to sandblast the text onto the VJAMM obelisk. David Williams of Williams Monument Company in Arvin picks out the lettering from the rubberized stencil to guide his sandblasting. 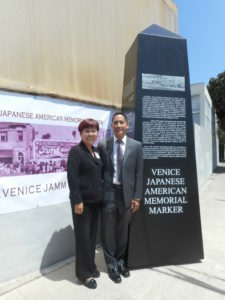 VJAMM Committee members Phyllis Hayashibara and Emily Winters pose with the FRONT of the VJAMM obelisk. GEO Engineer inspects the bottom of the footing and takes soil sample for testing. Shannon (with shovel) takes soil sample for testing, with David Perka (with bucket) assisting. 12 inches of slurry of gravel and sand recommended for stabilizing footing. Funeral service at West Los Angeles Buddhist Temple for VJAMM Committee member Yosh Tomita who passed away at the age of eighty on January 19, 2017. VJAMM Committee members pay their respects and stay for the bento luncheon provided by the Tomita family. LA City Construction Forces workers saw cut and break up part of the sidewalk in preparation for excavation and pouring the concrete foundation for the VJAMM. Chain link fencing around the plywood-covered hole displays VJAMM Construction banner. Benjamin Rizo, Jose Salas, Doug Fukuda, and David Perka of Los Angeles City Construction Forces Division saw cut the concrete, to be broken up and excavated. VJAMM Construction sign hangs from chain link fencing that protects excavated cavity covered with plywood. Construction sign acknowledges major donors to the VJAMM. VJAMM Committee members Brian Maeda, Alice Stek, Suzanne Thompson, and Emily Winters join Bruce Embrey and Warren Furutani at the Manzanar Committee party. Warren Furutani, community activist and Manzanar Pilgrimage pioneer, will keynote at the VJAMM Dedication on Thursday, April 27, 2017 on the northwest corner of Venice and Lincoln. Suzanne, Emily, Warren, Alice, and Brian at Manzanar Committee’s Holiday Party in January, 2017. VJAMM Committee member Alice Stek donates $5,000 to the VJAMM Committee, and will be acknowledged on the VJAMM with the Venice Peace and Freedom Party after her name. Alice Stek with Phyllis Hayashibara and Nikki Gilbert in 2016 at Hama Sushi. VJAMM Committee members Arnold Maeda and Brian Maeda donate $5,000 to the VJAMM Committee, in memory of their parents, Norman Toyoshige Maeda and Sasami Takeda Maeda. Brian Maeda and Arnold Maeda in 2014. Rigging bidding meeting onsite. Thomas Larsen, Project Manager, United Riggers and Erectors, Inc. 4188 Valley Boulevard, Walnut, CA 92789 (909) 978-0400, thomas.larsen@att.net, will transport and erect VJAMM while City builds foundation. Will also coordinate traffic mitigation with The Permit Company. Pre-construction meeting takes place onsite at the northwest corner of Venice and Lincoln at 10 am, with LA City GSD Construction Forces Division David Perka and Thomas Bylard; Senior Field Deputy Len Nguyen of LA City Councilmember Mike Bonin’s 11th District office; and VJAMM Committee members Kay Brown, Nikki Gilbert, Arnold Maeda, Phyllis Hayashibara, Suzanne Thompson, and Yosh Tomita. Phyllis gives Perka the blue rubbings of the bored holes at bottom of the VJAMM and David Williams’ contact numbers, emails the complete Soils report and Structural engineering report to Perka and Bylard. Arnold Maeda, Suzanne Thompson, Kay Brown, Thomas Bylard, David Perka, Phyllis Hayashibara, and Yosh Tomita mark the spot where the VJAMM will be installed on the northwest corner of Venice and Lincoln. Good sport Len Nguyen makes like an obelisk on the installation spot. NPS JACS approves VJAMM Reimbursement Request #4 in the amount of $10,933.88. Gerry Valido of Board of Public Works, Adopt a Median Program, emails City Permit A Extension to May 31, 2017, reference no. 59973. NPS JACS interim report FAXED and FedExed to Kara Miyagishima, with Reimbursement request #4 in the amount of $10,933.88. Los Angeles City Council passes Item #65 on Consent Calendar, to “transfer $47,322 in the Department of General Services Revenue Source No. 5188, to the below listed accounts and in the amounts specified in the General Services Fund No. 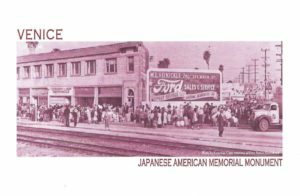 100/40 for costs associated with transporting, preparing the foundation, and installing the Venice Japanese American Memorial Monument, with installation to be completed on or before March 31, 2017: Account No. 001014, Construction Salaries, $16,887; No. 003180, Construction Materials, Supplies & Services, $30,435; TOTAL $47,322.” File Number 14-0349-s1. Suzanne Thompson hand-delivers VCHC/VJAMM check #1079 in the amount of $47,322 payable to City of Los Angeles-Dept of General Serv. Rose Karagezyan, Senior Management Analyst II, Department of General Services (213) 978-2793, rose.karagezyan@lacity.org, receives the check, and signs and dates the VJAMM acknowledgement of receipt. CalTrans grants VJAMM Encroachment Permit Extension 716-NRT-2210 to Permit 712-NAD-0955, through March 31, 2017. Fast Signs completes all edits requested and sends high resolution VJAMM files in a link to a DropBox folder: photo pdf, photo jpg, poster pdf, poster jpg, VJAMM front in pdf and word doc, back with map in pdf and word doc, quotes in pdf and word doc, acknowledgements in pdf and word doc. Brian stops by to visit the VJAMM in Arvin. Yosh Tomita contributes his quote for the VJAMM! Final text, map, quotes, and acknowledgements (as of September 27, 2016) emailed to VJAMM Committee members and Fast Signs for proofs, to be sent to NPS JACS and to David Williams of Williams Monument Company in Arvin, California. Santa Monica City Council grants $5,000 in contingency funds to the VJAMM, as requested by Mayor Tony Vazquez, Mayor Pro Tem Ted Winterer, and Council Member Kevin McKeown. Council Members Gleam Davis, Sue Himmelrich, Pam O’Connor, and Terry O’Day joined in the unanimous vote to authorize the funding. Arnold Maeda, Phyllis Hayashibara, Suzanne Thompson, and Dolores Sloan spoke on behalf of the VJAMM. Abbot Kinney Festival Association Community Grants Program awards $1,700 to the VJAMM Committee to fund the development, layout, printing, advertisement, distribution, and website maintenance of the 5th 8th, 11th, and 12th grade curricula on the Japanese American internment and the Venice Japanese American Memorial Monument. Award includes free Community Grant Recipients Booth at the 2017 Abbot Kinney Festival. VJAMM Committee members raised $95 towards the cost of the 2016 AKF booth by offering opportunity drawing tickets for $1 each. Winners took home two bowls and two sake sets (bottle and two cups) donated by Nikki Gilbert and Phyllis Hayashibara. Phyllis Hayashibara, Regina Barton, Alice Stek, and Emily Winters staff the VJAMM/VAC booth. David Williams of Williams Monument Company in Arvin emails to the VJAMM Committee photos of the VJAMM obelisk being shaped, polished, crated, and loaded into a shipping container in India. ETA in Bay Area port, first week of October, 2016. Strapping the obelisk for shipment from India to California: 12,500 pounds. NPS JACS approves VJAMM Reimbursement Request #3 in the amount of $17,792.55. VJAMM Committee celebrates Arnold Maeda’s 90th birthday (July 17th) at Hama Sushi. Len Nguyen presents Arnold with a City of Los Angeles Certificate of Recognition signed by Councilmember Mike Bonin and Mayor Eric Garcetti. Kay Brown and Esther Chaing congratulate Arnold Maeda on his ninetieth birthday. VJAMM Committee agrees to use version of April 25, 1942 photo WITH railroad tracks, in pink hue on VJAMM, and eventually on a new banner, on letterhead, and on the website. Cropped photo WITHOUT railroad tracks still on 4’ x 8’ banner, on VJAMM letterhead, and on the website. The word Monument replaces the word Marker on the website and letterhead. 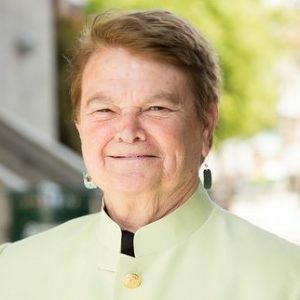 Sheila Kuehl, 3rd District, Los Angeles County Board of Supervisors sends a check for $4,500.00 in addition to the check for $500.00 received June 24, payable to Venice Arts Council/VJAMM. The VJAMM will permanently acknowledge Sheila’s contribution on the VJAMM list of major donors. 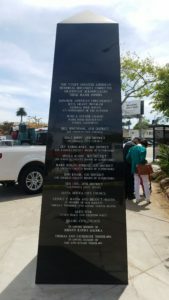 VJAMM Committee agrees on NEW WORDING for TEXT on VJAMM’s three paragraphs, name change to MONUMENT (from MARKER), edit for Arnold’s quote, addition of Sheila Kuehl, 3rd District, Los Angeles County Board of Supervisors; and changes to the map to Manzanar. NPS JACS interim report, due June 1, FAXED and FEDEXED to Kara Miyagishima, with Reimbursement Request #3 for Contractual Web Design ($2,500) federal share $1,666.75, and Deposit on VJAMM ($24,187.50) federal share $16,125.80 for total reimbursement request of $17,792.55. Phyllis emails extension request to CalTrans for Encroachment Permit, which expires July 1, 2016. Gerry Valido of Los Angeles City Street Services Adopt a Median Program emails that an extension to the City Permits will not be necessary, but work should be completed before the end of 2016. Suzanne, Mae, Alice, Brian, and Valerie attend the 47th Annual Manzanar Pilgrimage, and distribute VJAMM postcards at Brian’s Tule Lake booth and at Dow Villa Hotel in Lone Pine. 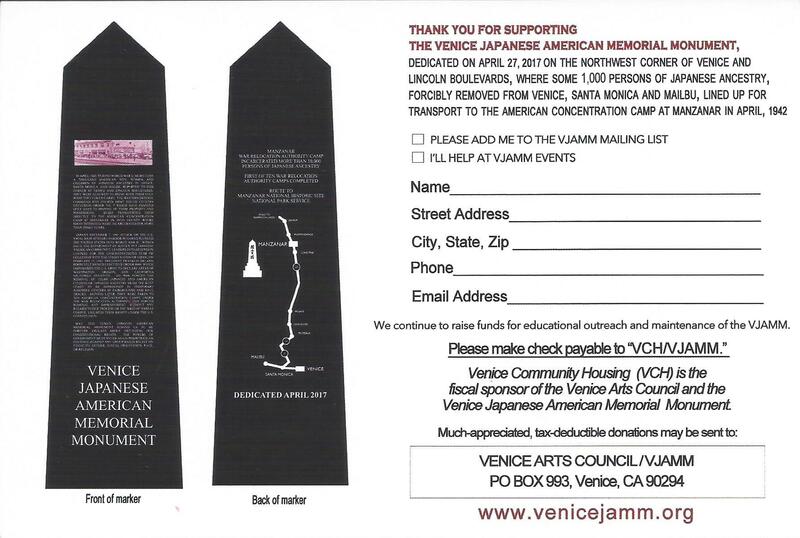 VJAMM Committee members pay $150.00 for a quarter page ad in the commemorative program at the bottom of page 30, overlooking a typo in the word, “America” instead of “American.” Ad reflects name change to Venice Japanese American Memorial Monument Committee, in consideration of the 9’ 6” height of the obelisk with the 3’ x 3’ base. Hama Sushi in Venice hosts fifth annual bento lunch and dinner fundraiser for the benefit of VJAMM. Sold a record 269 bento! Hama Sushi proprietor Esther Chaing donates $3,619.60 to the VJAMM Committee, bringing Esther’s total donation to VJAMM since 2010 to $14,536.43. Direct donations total $1,947.00 plus a pledge of $500 from LAC BOS Sheila Kuehl, 4th District, for a total of $2,447.00 in direct donations to VJAMM. $3,639.60 + $2,447.00 = $6,086.60 in total funds raised in conjunction with the VJAMM Fundraiser at Hama Sushi. Suzanne, Emily, Yosh, and Phyllis attended Great, Great, GREAT: A Celebration of Life for Bill Rosendahl at Mar Vista Park, 11430 Woodbine Street in Los Angeles, CA 90066, from 2:00 pm. 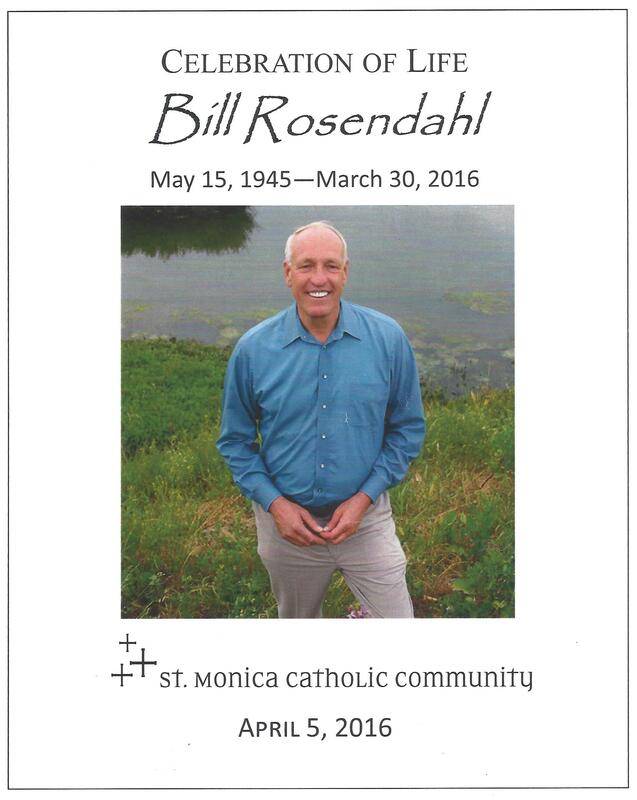 Phyllis attends the Celebration of Life for Bill Rosendahl, May 15, 1945 – March 30, 2016, held at St. Monica Catholic Community Church, 725 California Avenue in Santa Monica, at 10:00 am mass. Bill Rosendahl, former Los Angeles City Councilmember, 11th District, and champion supporter of the VJAMM, passes away in his home in Mar Vista at the age of seventy after a four-year battle against cancer. David Williams of Williams Monument Company in Arvin, California, receives deposit check from VJAMM for obelisk to be fabricated in India and engraved in Arvin. Phyllis Hayashibara, Alice Stek, and Suzanne Thompson drive to Arvin for photo op and visit to the Williams Monument Company. NPS JACS approves FINAL extension of VJAMM grant to July 1, 2017. Becky Dennison, Executive Director of VCHC, signs extension on behalf of VJAMM, after retirement of Steve Clare in early 2016. City of Los Angeles releases to VJAMM Committee Building Permit A, issued February 4, 2016 and extended to August 2, 2016. Permit R already issued 2015 June 1. Requests for extensions should be made in May 2016. NPS JACS approves VJAMM Reimbursement Request #2 in the amount of $1,045.05. CalTrans grants VJAMM Committee Encroachment Permit with corrected C-1 Design Plan with solid granite obelisk, signatures and seals from Civil Engineer and Structural Engineer, and stamp from CalTrans. Permit invalid if work not completed by July 1, 2016. About thirty days before July 1, 2016, extension must be requested. Two extensions of three months may be requested, after which we may have to re-apply. Contractor or installer must also apply for a “double permit,” and have two bonds, one for the permit and one for the installation. VJAMM would pay the engineering inspection and processing fees of $656.00. City of Los Angeles signs CalTrans Maintenance Agreement, a condition of CalTrans granting the VJAMM Committee an Encroachment Permit, and Len Nguyen delivered the Maintenance Agreement to CalTrans District 7. Memorial Service for Fred Hoshiyama at Centenary Methodist Church in Little Tokyo. Fred passed away November 30, 2015 one week shy of his 101st birthday, December 7. VJAMM Committee sent sympathy card to son Matthew Hoshiyama and daughter Bella. NPS JACS Interim Report FAXed and FedExed to Kara Miyagishima, after Phyllis emailed notice of one week delay (report due December 1, 2015). At the VJAMM Committee meeting, Nikki and Phyllis show the update to the www.venicejamm.org website, constructed with WordPress on the GoDaddy website, with technical consultation donated by Ron Gee of the Venice Hongwanji Buddhist Temple. New email: venicejamm@gmail.com. Youssef Pishdadian of CalTrans #7 in Los Angeles reports that CalTrans in Sacramento will not accept the signatures of the Assistant City Attorney and the Assistant Director of Street Services on the CalTrans Maintenance Agreement. Pishdadian has four new originals that require the signatures of Los Angeles City Attorney Mike Feuer, Los Angeles Street Services Director Nasario Salcedo, and Los Angeles City Clerk Holly Wolcott. One CalTrans signature already secured; CalTrans Deputy Director’s signature to be the final signature. Phyllis made copies of the correct C-1 Design Plan signed and stamped by the Civil Engineer and the Structural Engineer, with solid obelisk design, received by CalTrans on March 2, 2015 (to replace the old C-1 Design Plan with concrete core and granite slabs) at Staples on National. Len Nguyen picked up the four originals with correct C-1 Design Plan to secure the three City signatures required. Phyllis requested return of the four originals to her, so she can walk the four originals in to CalTrans #7 to secure the CalTrans Encroachment Permit, which the City requires before releasing Permit A to the VJAMM Committee. VJAMM displays flyers and posters at Abbott Kinney Festival in booth shared with Venice Arts Council. Nikki Gilbert donated one pair of ceramic bowls, and four pairs of ceramic tea cups for the “opportunity drawing.” One dollar donations towards the opportunity drawing netted $88, which helped pay for VJAMM’s half of the non-profit booth cost. Suzanne Thompson and Regina Barton set up and staff the VAC/VJAMM booth all day. 10th Annual Constitution Day Conference at Ronald Reagan Library in Simi Valley draws over 200 educators. VJAMM introduces Nikkei for Civil Rights and Redress workshop, “Stand Up For Justice: the Ralph Lazo Story.” The participants of the SUFJ workshop receive from VJAMM one of the following DVDs: Farewell to Manzanar (Jeanne Wakatuki Houston), Music Man of Manzanar (Lou Frizzell), or Days of Waiting (Estelle Ishigo); and $75 stipend for attending the Conference. DVDs and stipends budgeted under NPS JACS grant. Los Angeles City Councilmember Mike Bonin, 11th District, sends $5,000 donation check after belated processing of 2014 pledge, thanks to Senior Field Deputy Len Nguyen’s efforts. Los Angeles City Attorney signs the new, revised CalTrans Maintenance Agreement. Len Nguyen to secure signature of Los Angeles City Street Services. Phyllis to secure signatures from CalTrans, and then submit Maintenance Agreement to Los Angeles Adopt a Median Program for release of Permit A.
NPS JACS approves VJAMM request for Extention of grant to September 2, 2016. Brian Maeda presents website for movie, “We Said NO NO,” at the Terasaki Nibei Foundation on Wilshire in West Los Angeles. VJAMM revises letter of February 17, 2015 to CalTrans, per Youssef Pishdadian’s telephone notes of February, 2015, and attaches a copy of the Revocable Permit. VJAMM submits interim report to the NPS JACS grant program, and requests an extension of one year from September 2015 to September 2016. 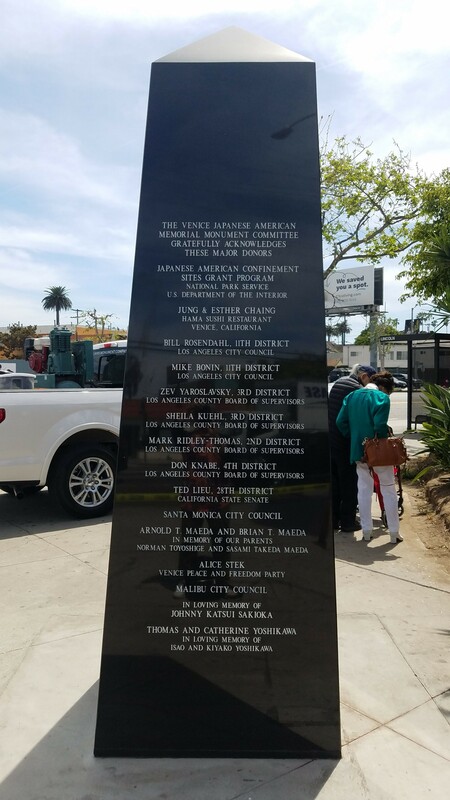 City of Los Angeles releases Revocable Permit R-1550-0037 to the Venice Japanese American Memorial Marker Committee, and names the VJAMM as responsible for maintaining the VJAMM obelisk as the corner of Lincoln and Venice Boulevards in CD11. Arnold Maeda, James MAC McPherson, and Paulina Sahagan speak at the Opening Celebration of the Michigan Avenue Neighborhood Greenway (MANG0) on 12th and Michigan, about their ethnically diverse communities in an integrated Santa Monica neighborhood. VJAMM Committee members donate $150.00 towards a congratulatory quarter-page ad in 46th Annual Manzanar Pilgrimage Program. Hama Sushi in Venice hosts fourth annual bento lunch and dinner fundraiser for the benefit of VJAMM. Program includes Steve Nagano’s “Six Weddings and a Dress,” with Chiyomi Ogawa of Manzanar; and James Murakami, Production Designer for Brian Maeda’s “We Said NO NO,” currently in production. Hama Sushi Proprietor Esther Chaing donates $3,247.50 to VJAMM, bringing her total donation to VJAMM to $10,916,83 since 2010. VJAMM Committee members donate $100.00 towards sponsorship of reception at Japanese Institute of Sawtelle after unveiling of Sawtelle Japantown sign with LA City Councilmember Mike Bonin, Japan Consul Harry Horinouchi, Sawtelle Japantown Association’s Randy Sakamoto, and Dr. Jack Fujimoto. Beautification “to grant VJAMM Committee revocable permission to encroach within the public right-of-way to install a black granite memorial obelisk at the northwest corner of Venice Boulevard and Lincoln Boulevard in Council District 11; requesting City Engineer to issue a no-fee Revocable Permit and a no-fee A-Permit for the work to be performed; requesting Bureau of Contract Administration to provide no-fee inspection of the project.” OCB Director Paul Racs; VJAMM’s Phyllis Hayashibara, Emily Winters, and Arnold Maeda; 11th District LA Councilmember Mike Bonin’s Senior Field Deputy Len Nguyen spoke in favor of the recommendations. Los Angeles City Bureau of Engineering’s Structural Engineering Division approves structural design as revised by Sullaway Engineering. VJAMM Committee resubmits CalTrans Encroachment Permit with new C-1 Design Plan showing solid granite obelisk, stamped and signed by Sullaway Engineering and CRC Enterprises, dated 11-4-14, and in compliance with LA City Bureau of Engineering requests for revisions. NPS JACS approves consultant selections of CRC Enterprises for the civil engineering, and of Sullaway Engineering for the structural engineering. Public Counsel John Bowman, land use attorney with Elkins Kalt Weintraub Reuben Gartside LLP in Los Angeles, advises that the VJAMM Committee concurrently and separately pursue BOTH Los Angeles City building permits AND the California State Department of Transportation encroachment permit. Both jurisdictions identify the VJAMM site as within their Right of Way jurisdiction. Title Search by Commonwealth Land Title Company in Los Angeles proved to be inconclusive. NPS JACS approves consultant selections of Ralph Stone and Company for the Soils Testing, and of Williams Monument Company for the granite obelisk and the engraving. Salyna Cun of Adopt a Median receives corrections of structural engineering calculations and C-1 design plans, signed and wet-stamped by Sullaway Engineering and CRC Enterprises. VJAMM must be approved by the City’s Bureau of Engineering’s Structural Engineering Division and the Commissioners on the Board of Public Works at its next regularly scheduled meeting. NPS JACS approves VJAMM Reimbursement Request #1 in the amount of $7,921.38. NPS JACS approves VJAMM Budget and Scope revisions submitted on October 29 and corrected and resubmitted on November 4, 2014. Los Angeles City Bureau of Engineering issues Work Order RR000020 for the VJAMM. VJAMM displays posters, flyers, and postcards at Abbott Kinney Festival in booth shared by Beyond Baroque and Venice Arts Council. VJAMM’s request for NPS JACS grant extension to September 1, 2015 approved, signed, and executed. Cultural Affairs Commission of the Los Angeles Department of Cultural Affairs grants conceptual and final approval to the VJAMM after presentation by VJAMM Committee members Phyllis Hayashibara, Suzanne Thompson, and Emily Winters. Len Nguyen, Deputy of Los Angeles Councilmember Mike Bonin’s 11th District Office, also attended and brought Bonin’s letter of support for the VJAMM. Debbie Dyner Harris, Director of Council District 11, meets with VJAMM Committee members Phyllis Hayashibara, Suzanne Thompson, and Emily Winters, with Len Nguyen also in attendance. Concludes that the VJAMM site lies within the jurisdiction of the City of Los Angeles. VJAMM Committee reaches $100,000 fundraising goal. VJAMM Committee congratulates the Manzanar Committee on its 45th annual Manzanar Pilgrimage in a full-page ad in the souvenir program. California State Senator Ted Lieu, 28th District, donates $5,000 to the VJAMM Committee. Hama Sushi in Venice hosts third bento lunch and dinner fundraiser for the benefit of VJAMM. Hama Sushi Proprietor Esther Chaing donates $2,971.00 to VJAMM, bringing her total donation to VJAMM, including art work commissions, to $7,669.00 since 2012. VJAMM and the Venice Hongwanji Buddhist Temple’s Buddhist Education Committee co-host the final Sunday in the BEC’s Film Festival series based on the theme of “exile.” Screenings include: “Of Civil Wrongs and Rights: the Fred Korematsu Story,” “Music Man of Manzanar,” and trailer for Brian Maeda’s work in progress, “We Said, No No.” Panel of speakers moderated by Phyllis Hayashibara include: Arnold Maeda, forcibly removed from Santa Monica and incarcerated at Manzanar at fifteen; Hank Iwamoto, self-exiled from California to Colorado and Oklahoma; Bill Nishimura, No No Boy, forcibly removed from Poston to Tule Lake to Santa Fe and finally to Crystal City; and Brian Maeda, born in Manzanar, member of the Manzanar Committee which organizes the annual Manzanar Pilgrimage on the last Saturday of April. Mike Bonin, Los Angeles City Councilmember, 11th District, pledges $5,000 to the VJAMM Committee. Sullaway Engineering completes structural engineering calculations for the VJAMM obelisk of solid granite and prescribes 4’ 10” x 4’ 10” x 2’ 6” deep concrete foundation with four #4 rebar anchored into concrete and drilled and epoxied into base of obelisk. Don Knabe, Los Angeles County Board of Supervisors, 4th District, donates $5,000 to the VJAMM Committee. VJAMM submits its third biannual report to the NPS JACS grant program, and requests an extension of one year from September 2014 to September 2015. Yosh Tomita observes soil sampling. Digalert concludes that no utilities lie beneath grade where the VJAMM will be installed. Arnold Maeda speaks at a public meeting which drew over 50 community members at the Department of Water and Power office in downtown Los Angeles, to protest the planned DWP 1,200-acre solar farm’s location near the Manzanar National Historic Site. DWP extended deadline for public comment through November 26, and a second time through December 20, 2013. VJAMM displays new poster and distributes new postcards and flyers at the Abbott Kinney Festival in Venice, thanks to the generosity of the Venice Arts Council/Beyond Baroque, the Free Venice Beachhead, and the Venice Peace and Freedom Party, which made room for the VJAMM materials at their booths. California Office of Historic Preservation, Department of Parks and Recreation, concurs with the National Park Service finding of No Historic Properties Affected by the VJAMM project. 9th Annual Constitution Day Conference: Resources for Teachers, K – 12 at the Ronald Reagan Presidential Library in Simi Valley draws over 200 educators. Workshops on the forced removal and incarceration of persons of Japanese ancestry during World War II include: Teaching the Constitution: “Of Civil Wrongs and Rights, the Fred Korematsu Story,” presented by Karen Korematsu, Co-Founder and Executive Director of the Fred T. Korematsu Institute for Civil Rights and Redress; Japanese Americans and WWII Incarceration: Histories and Controversies, presented by Lane Hirabayashi, Professor and Aratani Endowed Chair of Asian American Studies at UCLA; and “Stand Up for Justice: the Ralph Lazo Story,” presented by Kathy Masaoka and Suzy Katsuda of the Nikkei for Civil Rights and Redress Committee. The 53 participants of the “Stand Up For Justice” workshop receive one DVD (Farewell to Manzanar, Music Man of Manzanar, or Days of Waiting), and a $75 stipend for attending the Conference. VJAMM’s grant from the National Park Service Japanese American Confinement Sites program underwrite the costs of the DVDs and the stipends. Mark Ridley-Thomas, Los Angeles County Board of Supervisors, 2nd District, donates $5,000 to the VJAMM Committee. Family and friends celebrate the 90th birthday of VJAMM Committee member Mae Kakehashi at the Venice Japanese Community Center. At VJAMM’s request, Mark Antonio Grant of Los Angeles City Councilmember Mike Bonin’s 11th District office, presents Mae with a City Resolution honoring Mae, signed by all Los Angeles City Councilmembers and the Mayor of Los Angeles, Antonio Villaraigosa. VJAMM Committee members Brian Maeda and Alice Stek participate in 44rd Annual Manzanar Pilgrimage, and distribute VJAMM postcards and brochures. The VJAMM Committee congratulates the Manzanar Committee in a full page ad in the commemorative souvenir program. Scott Pine and Bill Rosendahl pose with full-scale model of the VJAMM. VJAMM Committee announces it has raised over $80,000, and hopes to raise a total of $100,000 for the fabrication, installation, and maintenance of the VJAMM, to be dedicated April 25, 2014. Zev Yaroslavsky, Los Angeles County Board of Supervisors, 3rd District, donates $5,000 to the VJAMM Committee. California Coastal Commission grants waiver no. 5-12-265 for the granite VJAMM obelisk, 9 foot 6 inches tall with a 3 foot by 3 foot base, to be installed at the northwest corner of Venice and Lincoln Boulevards, with provisions for four informational signs to be attached to existing poles near the intersection. VJAMM Committee congratulates Mary Nomura, Song Bird of Manzanar, as 2012 Nisei Week Parade Marshal at the 72nd Annual Nisei Week Foundation Awards Dinner at the Double Tree Hilton in Little Tokyo, and in ads in the Rafu Shimpo and the 2012 Nisei Week commemorative program. VJAMM Committee members Phyllis Hayashibara, Mae Kakehashi, Arnold Maeda, Brian Maeda, Alice Stek, and Emily Winters participate in 43rd Annual Manzanar Pilgrimage. The VJAMM Committee congratulates the Manzanar Committee in a quarter page ad in the commemorative souvenir program. 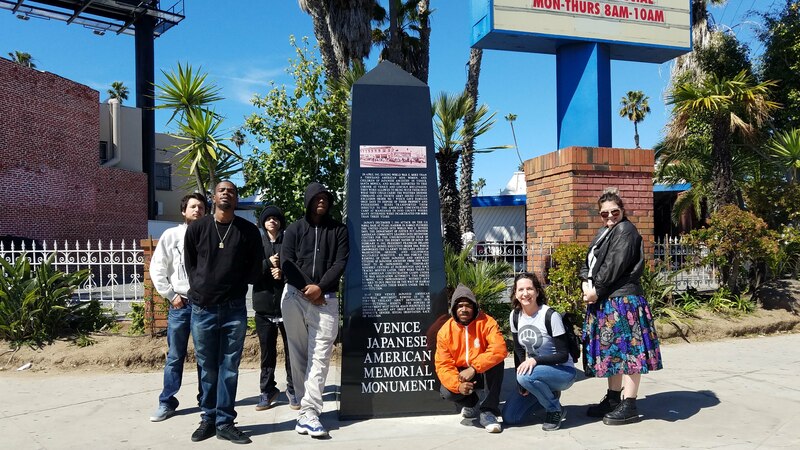 VJAMM Committee commemorates the 70th Anniversary of the start of the forced removal of persons of Japanese ancestry from the West Coast, and “unveils” a full-scale model of the VJAMM obelisk on the northwest corner of Venice and Lincoln. Hama Sushi in Venice hosts bento box, dinner, and art gallery fundraisers for the benefit of VJAMM. Hama Sushi Proprietor Esther Chaing contributes $1,571.53 to VJAMM (92 bento lunches sold in 2012). Councilmember Bill Rosendahl authorizes Rothman Engineering to apply for the CalTrans Encroachment Permit on behalf of the City of Los Angeles/VJAMM. Application declined on June 11, 2012, pending additional conditions, including copy of ACR 46, Maintenance Agreement signed by LA City, double permit for installation by other than the City of Los Angeles, and original C-1 Design Plan with red marks for revisions. The U. S. Department of the Interior announces VJAMM as the recipient of a $50,000 National Park Service Japanese American Confinement Sites grant, after initial inquiry by Arnold Maeda. Joe Belli and Eric Schmid of the Venice Hongwanji Buddhist Temple respond to Phyllis’ plea for assistance in designing the VJAMM obelisk and building a full scale model, 9 feet 6 inches tall with a 3 foot square footprint. Dustin and Darin Noriyuki, Kay Brown, Phyllis Hayashibara, and Emily Winters help drill, sand, paint plywood on metal framing on casters by the end of March. hosts VIP Reception featuring Nikki Gilbert’s Sushi Girl, Suzanne Toji’s Feast from the East chicken salad, and Juana Carrillo’s Sakura Gourmet Pastries; auctions donated original artwork; raffles donated prizes, and raises $10,001. Venice Arts Council distributes VJAMM information at the Abbott Kinney Festival. VJAMM distributes information at the Venice High School Centennial Celebration. Venice Neighborhood Council votes to increase funding for VJAMM’s Community Improvement Project application to $1,300, after Community Officer Ira Koslow moves to increase VJAMM’s allocation from $500. for VJAMM with official city memorial plaque, through the initiative and efforts of Suzanne Thompson. Los Angeles City Councilmember Bill Rosendahl, 11th District, donates $5,000 to the VJAMM Committee at a symbolic “ground breaking” ceremony at Venice and Lincoln Boulevards. California Assembly Member Betsy Butler and California State Senator Ted Lieu co-sponsor Assembly Concurrent Resolution 46, requesting the Department of Transportation issue an encroachment permit for the placement of the VJAMM at the northwest corner of Venice and Lincoln Boulevards [passed], after successful negotiations led by Suzanne Thompson. Beyond Baroque hosts a reading in Japanese and English of haiku written by internees in Rohwer and Jerome, Arkansas camps, from “May Sky: There is Always Tomorrow,” edited by Violet Kazue de Cristofor; and a panel discussion with Bruce Kaji, Founding President of the Japanese American National Museum; Patricia Wakida, JANM Curator; Douglas Messerli, Sun and Moon Press publisher; Phyllis Hayashibara, VJAMM Committee member. Los Angeles City Council approves Rosendahl’s motion. Public Works Committee approves Rosendahl’s motion. VJAMM Committee holds a community meeting at the Venice Hongwanji Buddhist Temple to discuss the design and scope of the proposed memorial marker. 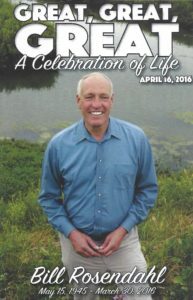 Los Angeles City Councilmember Bill Rosendahl introduces a motion supporting the memorial marker; Los Angeles City Council refers the motion to the Public Works Committee. Venice Neighborhood Council votes unanimously to support VJAMM’s efforts to erect a memorial marker on the northwest corner of Venice and Lincoln, after presentations by Phyllis Hayashibara, Arnold Maeda, Scott Pine, Alice Stek, and Emily Winters. Emily Winters, Venice Arts Council; Suzanne Thompson, Venice Arts Council; Don Geagan, Free Venice Beachhead; Fred Hoshiyama, Venice-Culver Japanese American Citizens League; and Phyllis Hayashibara, Social Studies Teacher at Venice High School, meet for the first time as the ad hoc Japanese American Memorial Marker Committee (later to be called the Venice JAMM committee) at Venice High School, Room 133 on Tuesday after school. Free Venice Beachhead prints names of Venice High School students who have written to Rosendahl in support of the memorial marker, and a brief history of the memorial campaign that had begun after the attacks on U. S. targets on September 11, 2001 and subsequent attacks on persons perceived to be Middle Eastern or Muslim. 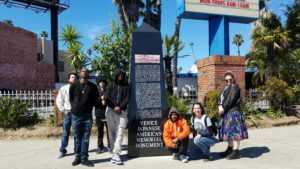 Free Venice Beachhead prints letters written to Rosendahl urging support of the memorial from Mrs. Hayashibara’s New Media Academy Honors U. S. History students, beginning with the first letter from Athena Padilla. At the invitation of Councilmember Rosendahl, students in Mrs. Hayashibara’s New Media Academy Honors U. S. History class travel by Rosendahl-chartered bus to City Hall to make a presentation before the City Council. Student Felix Barron reads what he had emailed to Rosendahl, urging him to support the memorial marker before people completely forget what had happened on Venice and Lincoln in April, 1942. Free Venice Beachhead first prints photo from April 25, 1942 above the masthead. Venice Peace and Freedom Party collects hundreds of names of Venice residents on a petition in support of the marker, and sends them to then-Councilmember Ruth Galanter, who was moved to the East Valley by the Los Angeles City Council before she could take any action. Former LA City Councilmember Ruth Galanter at 2013 VJAMM Fundraiser at Hama Sushi in Venice. Galanter told of her successful motion to cede city property to the Manzanar Committee for what would become the Manzanar National Historic Site off Highway 395 between Lone Pine and Bishop.